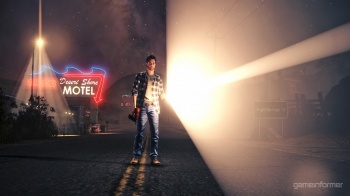 Rumors that Alan Wake is coming to the PC are once again flying fast and furious. If you're a true PC gamer, then you probably have a long memory and a tendency to hold a grudge, and that means that you remember a time when Alan Wake was a PC project. But then it went dual platform with the Xbox 360, and then came the sad day when we were told that the PC was out: Alan Wake would be an Xbox 360 exclusive. And there was much anger! But perhaps the time to simmer down has finally arrived, as users on the Alan Wake forums have discovered a listing for Alan Wake in the Steam registry. Three separate screens of the registry entry were also posted, along with a reminder that "Sonic Generations PC version was leaked in the same way." That in itself doesn't necessarily mean much, but it becomes a whole lot more interesting when seen in the light of a comment made by Remedy's Aki JÃ¤rvilehto during an interview with Finnish website YLEX [via JustPushStart]. "We have received feedback from a lot of PC gamers, and I have to admit that yes, we somehow ignored that," he said. "Let's see if in the near future we could have some positive news to tell you about dating!" "Dating," in this case, presumably refers not to a night on the town in Bright Falls but rather a day on the calendar that somehow relates to whatever it was that JÃ¤rvilehto was talking about. Oh, right - Alan Wake on the PC! Don't get too wound up over this just yet, because Remedy hasn't actually said anything about it one way or the other, but we've reached out to them and will give you a heads-up in and when they do.